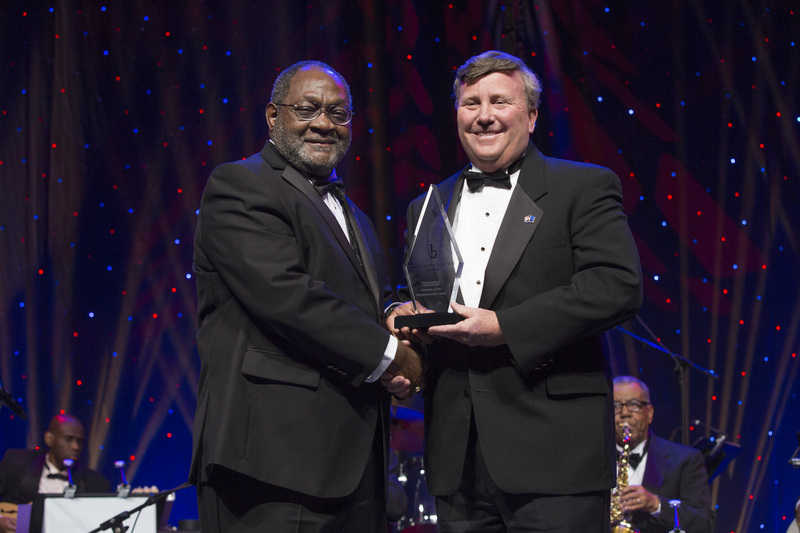 Welding engineering alum Ernest Levert receives the 2015 BEYA Career Achievement Award from Lockheed Martin Missiles and Fire Control Executive Vice President Rick Edwards at the 2015 BEYA Awards Gala.Once called a foolish dreamer by his junior high school classmates, Ernest Levert has proven that with determination and talent, dreams do come true. Today, he is a Lockheed Martin Fellow—an elite group representing less than 1 percent of the company’s technical workforce—at Lockheed Martin Missiles and Fire Control in Dallas. His work focuses on applying his welding engineering expertise to solve technical challenges across the corporation, leading training for production operations and conducting research for new projects. The personal accomplishments he’s most proud of include working on the International Space Station and using his expertise in electron beam welding to join together live missiles as part of the Army Tactical Missile Systems project. Levert has received many accolades throughout his career, including The Ohio State University College of Engineering’s Distinguished Alumni Award in 2012. Levert’s dream to become an engineer began at an early age, when he watched a movie about welding during his eighth grade metal shop class. After attending the Max Hayes Vocational School in Cleveland where he learned the art of welding, Levert joined the Navy. The Vietnam veteran said he knew Ohio State was the perfect choice for him after learning it offered the only accredited welding engineering program in the country. During his junior year at Ohio State, Levert met Ron McNair—the second African American ever to fly in space—whose advice changed the scope of his future career. So he did. Today, Levert travels the globe sharing his expertise in laser and electron beam welding processes across Lockheed Martin and with colleagues around the world. Accustomed to the roles of leader and pioneer, Levert was the first African American to be elected president of the American Welding Society, the first African American elected President of the Federation of Materials Societies, and is the first African American to serve on International Institute of Welding Board of Directors. Just as important to Levert as achieving his own dreams, is inspiring others to achieve theirs. He credits having strong role models, namely his parents and members of the Calvary Hill Baptist Church in Cleveland, with starting him on the path to success. Now he’s determined to be a strong role model for the next generation. At age 18, Levert became a Boy Scouts of America scoutmaster. He was instrumental in establishing the Boy Scouts of America Welding Merit Badge and today half of the Eagle Scouts in his troop are pursuing STEM/engineering careers. “I want to make sure I give back to these kids. I go back to when I was in Cleveland, Ohio, at the time I was 18 years old, and all I wanted to teach these kids was, ‘if I can get out of the hood, so can you.’” said Levert. Levert also makes it a priority to help inspire the next generation of STEM professionals. Each year he participates in multiple STEM events, including BEYA career fair activities, career day events and Engineers’ Week events. He frequently attends the Ohio State Minority Engineering Program banquet, where he serves a role model to current students. He also shares advice and subject matter expertise with other professionals. “If can help one person, and that person helps another, then we can be successful in changing the world,” he said.